"Here is everything I know and some things I just found out about ailanthus. Ailanthus ,AKA The Tree of Heaven, is a native of China. It was planted in US cities because of the ability to grow in polluted environments. Of course it escaped and colonized field margins out competing native species. It is fast growing, spreading rapidly by seeds and suckers. The roots are classified as poisonous (I need to find out more about that little gem) and can cause problems with water sources like springs and streams. When the wood is milled, it STINKS. Someone told me it smells like goat urine but since I have never had the pleasure , stinks will suffice. Ailanthus is difficult to dry because it twists, cups and sometimes gets like a washboard. This last characteristic I assume is caused by what seems to be a big difference in density of the early and late wood. 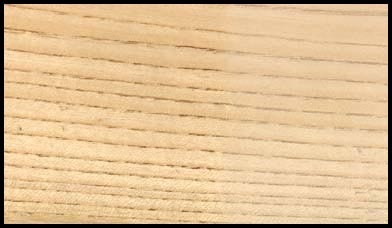 The early wood is very light in color, similar to sap maple and the late wood is darker. I am assuming that the larger, harder, more dense rings are late wood and the open grain smaller rings are early (spring) wood. This results in a striking pattern of wide white stripes delineated by narrow dark brown lines. It does not have the same contrast however as for instance zebrawood. The wood is surprisingly heavy, seems fairly hard and sands well, resulting in a feel that reminds me of hard maple. As I said earlier, you have to be careful not to feed too slow or hesitate when power routing or sawing because the wood will burn. When quartersawn it has a ray fleck finer than sycamore.